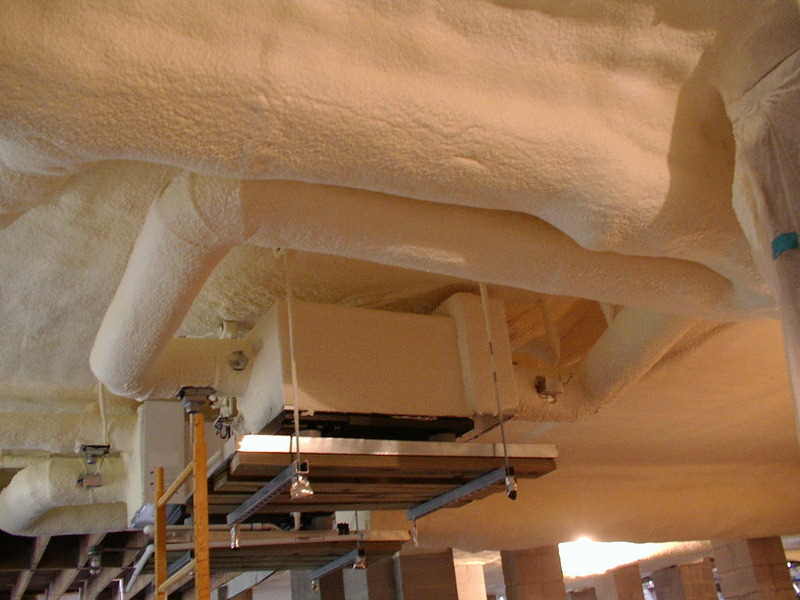 Our open cell and closed cell polyurethane foam insulation products provide unparalleled benefits to the owners and the occupants of treated buildings. Our products have received abundant praise for the long-term advantages they have provided our customers. See what people are saying. Seamless air barrier* reduces uncontrolled air leakage, lowering energy costs for homeowners – up to 40% energy savings compared to other insulation. Improves overall structural strength of wall, floor, and roof systems and inhibits air infiltration by conforming to the shape of cavity. Does not sag or settle. Reduces condensation, moisture, and mold,* improving comfort, health, and safety. Also helps to keep out dust and pollen and has been found to inhibit insects and critters. Higher R-values than conventional insulation. Reduces the household’s annual energy consumption. Guarantees a quieter home with improved acoustic properties. *See Important Customer Information below. To give an example of the stress the summer months put on an A/C unit, we often service attics where temperatures range between 130° and 140°. This puts the A/C unit at a tremendous disadvantage, as it is trying to maintain a comfortable living temperature of about 68° to 72° just beneath the ceiling. We have had abundant feedback from A/C companies that these attics are usually no hotter than between 85° and 95° on the hottest of summer days after insulating with our product. This means that the A/C unit is no longer struggling to perform, resulting in a healthier, more comfortable working environment – which increases the longevity of the unit – and greater savings for the homeowner on annual energy usage. Example of closed cell foam under home and around A/C ducts. 1) Approximately 3 inches (R-19) of our closed cell insulation is an industry average, offering the best dollar value for energy efficiency. 2) The product will actually add strength to the floor. 3) Closed cell foam will control the amount of moisture penetrating the floor, a prevalent concern in coastal climates. This helps to prevent decorative flooring materials from warping and absorbing moisture, and inhibits mildew on subfloor surface. Note: Many times in coastal South Carolina we have seen mildew under sub-flooring behind fiberglass batts. This is due to moisture condensing in the absorbent fiberglass under the surface of the floor, a result of the cooler temperature in the house and the warmer, moister air in the crawl space. 4) Closed cell foam will help to inhibit pests like roaches and mice from entering the house because it effectively seals any cracks or gaps around floor penetrations such as A/C vents, electrical, and plumbing, etc. 5) Closed cell also controls the area that is sprayed from dust and pollen. 1) 5+ inches of our open cell insulation will offer an approximate R-19 value. Open cell foam in attic between rafters and covering interior gable. 2) Air conditioning and ducting are often in an attic space. Installing foam under the roof deck and closing off all ventilation (to create what is known as a non-vented attic) will allow the air conditioner to operate with greater efficiency. When the temperature in the attic remains more moderate the A/C unit is in a healthier environment. It is less likely to sweat and mildew is less likely to collect in the exterior duct surfaces and mastic. 3) As a non-vented attic, pollutants, pollen, and dust are no longer entering through the original vented areas. 4) It is less likely that small animals will enter attic. 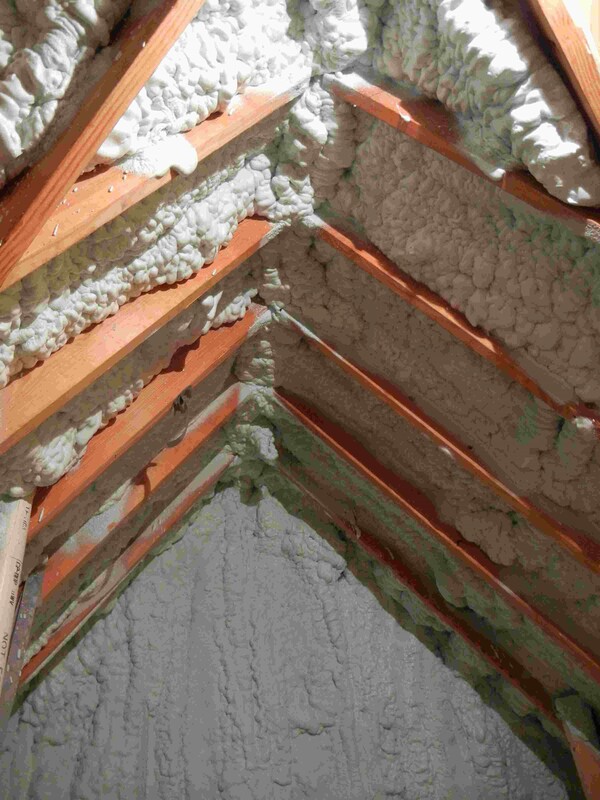 5) If the existing insulation is removed, installing foam against the roof will create a more dust-free environment, as fiberglass particles will no longer come through light fixtures and attic accesses, etc. We at Foam Tech Professionals have almost two, full decades of experience installing closed and open cell polyurethane foam insulation. During this time, we have treated many attics, working in new construction and retro-fitting older homes. It has been our practice from the beginning to advise homeowners to install a dehumidification system in treated attics – a system completely separate from the A/C system. It is our endeavor to seal a retro-fitted attic as best we can; however, a 100% airtight seal cannot always be guaranteed. Installation of a dehumidification system will remove any moist air in the attic thereby inhibiting the growth of mildew and mold so prevalent in our humid, coastal climate. This is a wise decision for any owner, as moist air can come through gaps in walls, bad windows seals, etc. and we do not want that to settle in our treated attics. Again, we highly recommend a separate dehumidification system to inhibit this possibility. If you are curious about the existence of such energy breaches in your home, consider a Blower Door Test. We are happily in an age where homeowners are looking for greater energy efficiency in a home and a Blower Door Test is a great place to start. A blower door is a machine used to measure how airtight a building is between building sections (living space, attic, crawl space, garage, etc.) or ducting to help physically locate air leakage sites. After correcting one of the largest energy breaches with our product in an attic or crawl space, we encourage our customers to have an independent company conduct a Blower Door Test to determine how they want to address other leakage sites in their home, such as door and windows treatments. So there is no conflict of interest, Foam Tech Professionals does not conduct this test; however, we can recommend some independent energy audit companies to assist our customers.